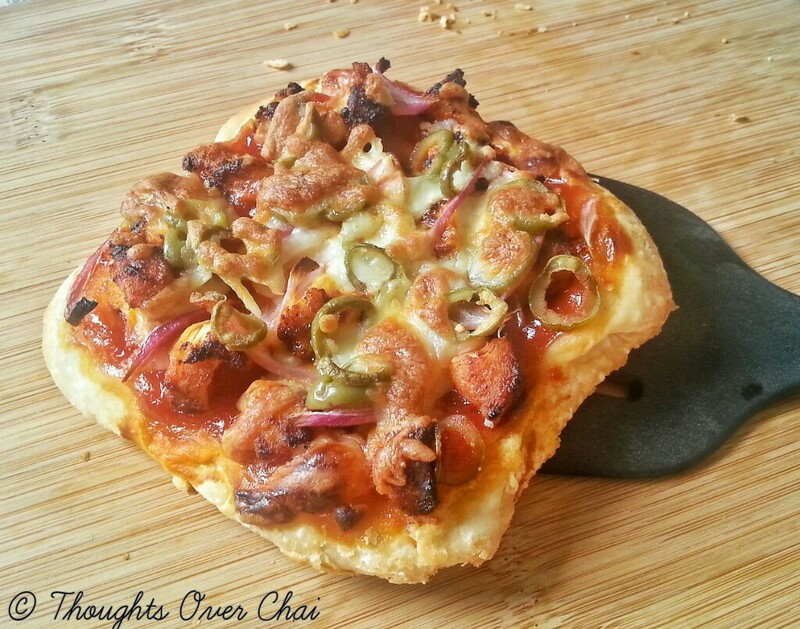 August Baking Challenge and Puff Pastry Pizza. I have always loved puff pastries right since my childhood when mom used to get for us in the evenings from a bakery or when we started buying our own from the school canteens- the flaky texture, the crisp sound when you bite into it and a light buttery puff, whats not to love? This month’s baking challenge, suggested by Sangeetha Priya of Nitha Kitchen included any recipe of our choice but making puff pastry dough from the scratch was mandatory. The day I received an email for the August’s challenge, I was little bewildered since I had never tried making a puff pastry dough at home and at the same time a bit delighted as Baking Partner’s challenge is all about venturing out of the comfort zone and putting efforts in something that we are unaccustomed to, yet simultaneously learn new aspects of baking. She made spinach pinwheels that looked absolutely gorgeous party munchies and which I am looking forward to in my next probe to these amazing puff pastries. When I was all set to take in the challenge I was hoping the result to be hundreds of buttery flaky layers, crisp and puffed – an ultimate kitchen achievement that could be worth shouting from a rooftop but I was taken by sheer surprise when while rolling the dough for the second time a top layer tore and the butter oozed out. I have no reason to blame the rising high temperatures in Dubai had I rested the dough and butter for a slight longer time in the refrigerator. Luckily on the same day around same time albeit preparing the dough I was also cooking Orange Chicken for dinner, otherwise I would have sobbed my heart out for wasting so much of the flour and butter. Even though husband came and ask me what happened with the task that I was performing, I quietly wrapped the dough in a neat cling film without uttering a word and let it go in the refrigerator again, though I knew I’d rack brains next day to somehow put that dough to use. So folks, today I don’t have a recipe for excellent puff pastry dough to give you but I am linking the video in anticipation that it’ll be useful to you in one way or the other. 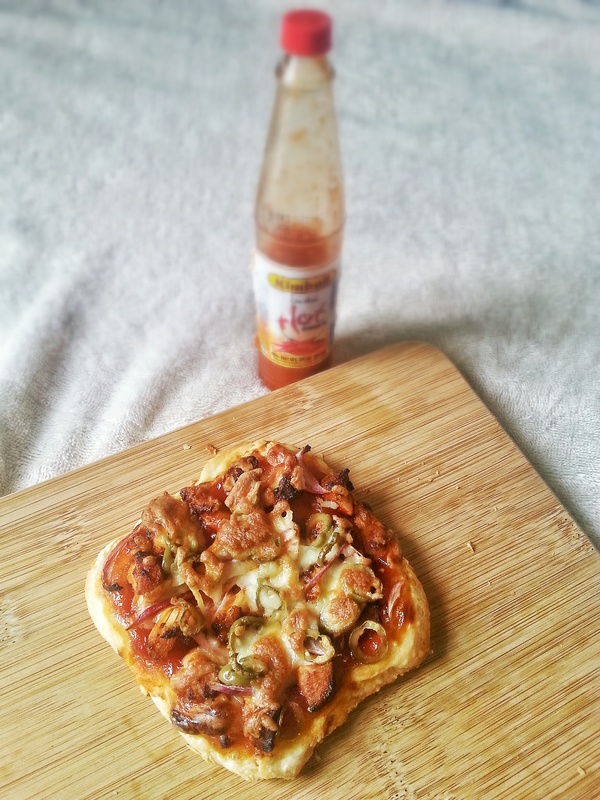 What I have currently to give you is a simple pizza recipe that can be made either on the pizza dough or on a pastry sheet. I was not going to give up as quickly, so on the following day I again followed the recipe to the T with the same day-old dough that tore and proceeded with making a pizza of my choice. I don’t know how creative that is sounding but I felt creative at the moment and that’s what counts, right? It tasted great; though I missed the flakiness (that puff pastry delivers) and sure to make for a great evening snack. Or when you have those unexpected guests at home, all you want to do is prepare an easy and quick appetiser to entertain them. This is the answer! Puff Pastry Sheets – 1, cut in squares. Chicken – 200 gms, boneless cut into bite sized cubes. Onions – 1, thinly sliced. In a bowl, prepare a marinade by whisking together yoghurt, ginger garlic paste, salt, red chilli powder, garam masala powder and lemon juice. Add in chicken and let it rest for atleast an hour. In a pan heat oil and cook the chicken pieces on medium-low flame till they are cooked through or alternatively grill them in the oven. Keep it aside. Cut the pastry sheets into squares and lay them on a baking tray lined with parchment paper. Preheat oven to 200 Degrees Celcius. 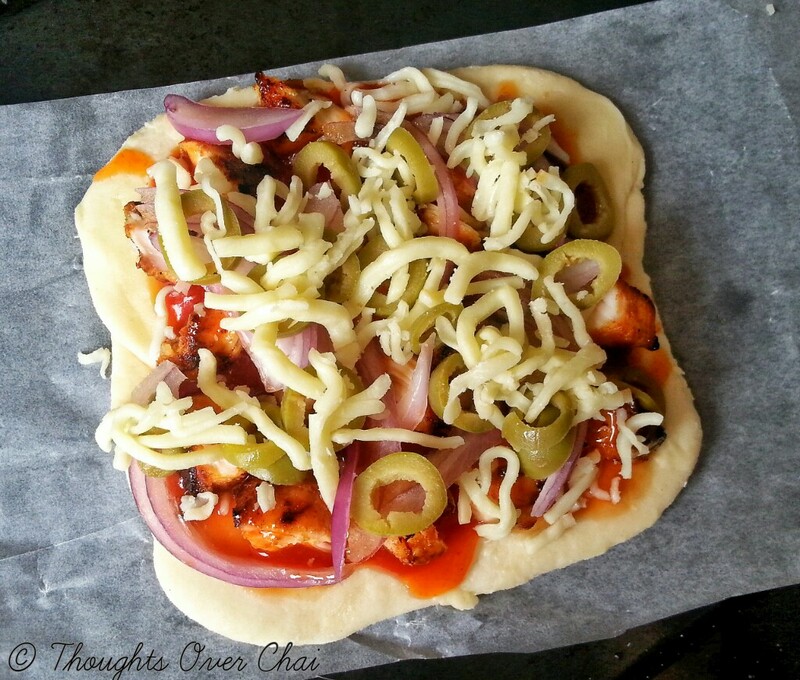 On each puff pastry square smear the pizza sauce with a back of the spoon and top with chicken tikkas, onions and olives. Sprinkle thyme and shredded cheese to cover. Bake in the oven for 20 -25 minutes or till the pastry get the nice golden brown color. Serve hot. 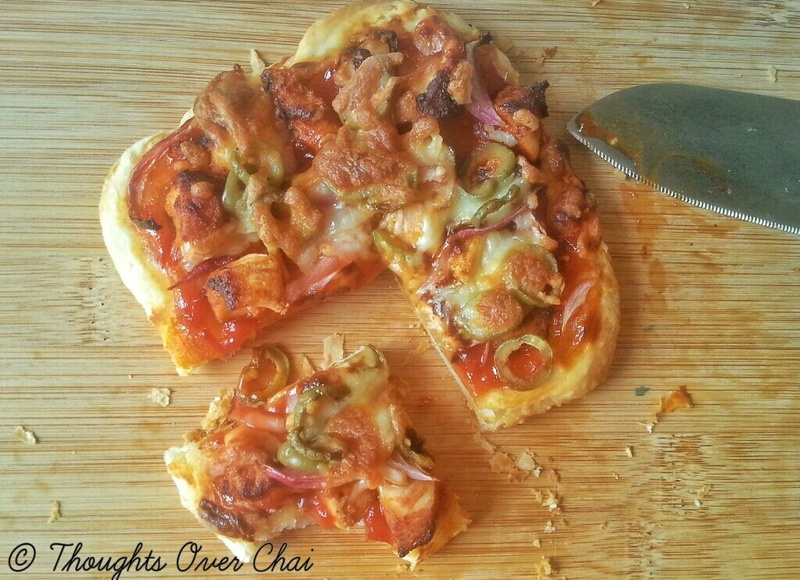 Delicious puff pastry pizza, next time try to freeze more often if butter ozze out . Thank you Swathi. I’ll make sure next time I proceed with some more precautions unlike this time but this challenge was totally fun. thanks for the mention Tasneem, they came out absolutely delicious!! !